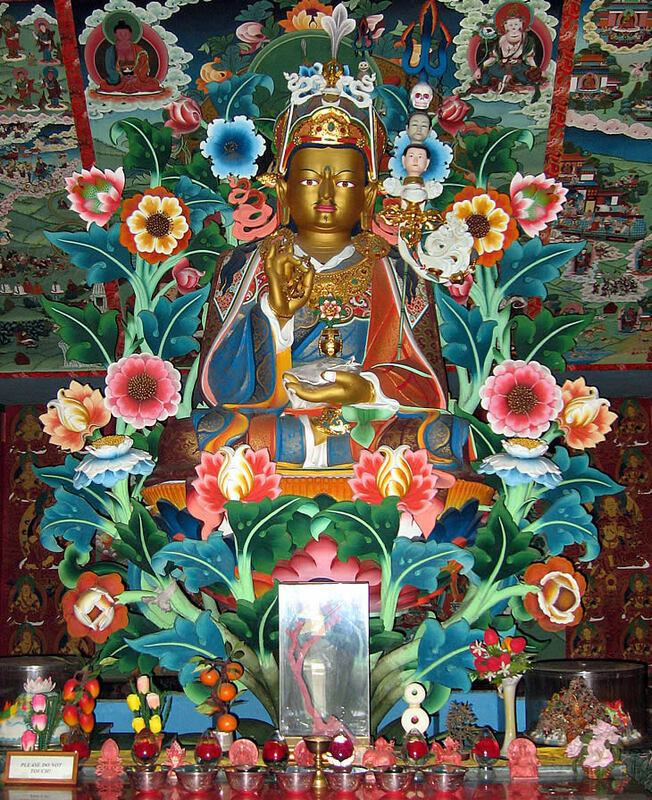 The stupa’s ground level shrine-room is dedicated to Padmasambhava. The exquisite murals in it depict the life-story of Padmasambhava in accordance with the terma of Ogyen Lingpa, Kathang Sheldrakma (the Crystal Cave Chronicles) with the hundred and eight chapters. In addition to this are murals depicting the assembly of Le u DÄnma (the Seven Chapter Supplication), Barchad Lamsal (Supplication for Clearing the Obstacles to the Path), the outer, inner and secret assembly of Rigzin Thugthig (Heart-Essence of the Vidyadharas), the short depiction of the past lives of Terchen Jurme Dorje (Terdag Lingpa), the One Hundred and Eight Mahasiddhas of India, the Twenty-Five Disciples of Padmasambhava, the Hundred and Eight Great Tertöns, the Eight Great Chariots of the Practice Lineage and various dharmapalas with their retinues.